Les Baer Custom (LBC) is a highly respected maker of “semi-custom” 1911 pistols and AR platform rifles. Now Baer moves into the precision bolt-action rifle market with impressive new offerings for 2010. Baer will sell two different bolt-guns, each fitted with a Stiller custom action and a cut-rifled barrel made in-house by LBC. Available chamberings (for both models) are .243 Win, .260 Rem, or .308 Win (later this year LCB will release a .338 Lapua). Remarkably, Baer guarantees these new guns can deliver half-MOA 10-shot groups with match grade ammo. The new Les Baer Custom bolt-action rifles all feature a Stiller Tac 30 action with Picatinny rail, Wyatt precision floor plate with Wyatt detachable box magazine (DBM), along with a “match grade” 24″ cut-rifled, 5-groove LBC barrel. A Timney match trigger with 2.5-lb pull is fitted, and both action and barrel are coated in a matte-black Dupont S finish. Two different Bell & Carlson composite stock designs are offered. 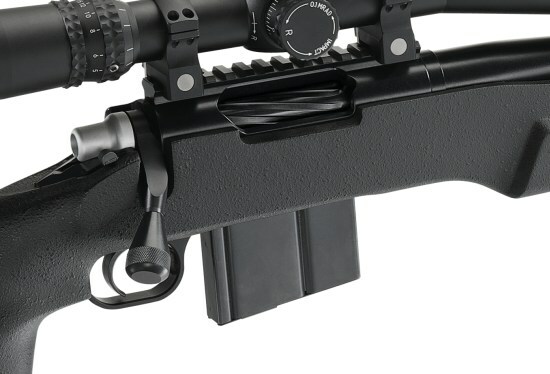 The LBC Tactical Recon Bolt Action Rifle features a tactical-style stock, similar in appearance to the SAKO TRG stock. It has a vertical pistol grip, undercut toe, plus an adjustable cheekpiece and adjustable buttplate. MSRP for the “Tactical Recon” model is $3560.00. If you want a lighter rifle with a more conventional stock, the LBC Tactical Varmint Classic features a varmint-style composite stock with a narrower fore-arm, “standard” wrist-grip shape, and a straight comb. There is a small hook in the underside of the buttstock. Like the “Tactical Recon” model, the “Tactical Varmint” features a Stiller action, Wyatt bottom metal/magazine, and 24″ cut-rifled barrel. MSRP for the “Tactical Varmint” is $3410.00. The new LBC rifles will debut next week at SHOT Show in Las Vegas. We hope to get our hands on one for field testing. It will be interesting to see if the rifles can really put 10 shots inside one-half inch (center to center) at 100 yards. Share the post "New Tactical Bolt Action Rifles from Les Baer"
Very nice looking rifles but my brain still questions whether shooters will typically be able to meet that accuracy guarantee with typical “match grade ammo” (Fed Gold Medal Match, Black Hills, etc.). While the match ammo made by these companies is excellent, to do 10 shot sub .5 MOA groups on any consistent basis typically seems to require (at least for me) some careful tailoring of the ammo to the rifle, fire formed brass, etc. The rifles look great and appear to have a lot of good components, although an LBC brand barrel is a bit of an unknown. 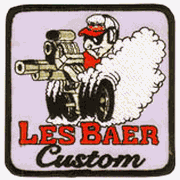 Then again, maybe Les Baer is also a great (but lesser known) high end accuracy barrel maker, and no doubt his customers will find out! I wish him the best with his new product offerings. Those are sharp rifles. It seems odd that there’s no 223/ 5.56 caliber offering. I like the varmint model. I like that it’s blacked out. I like that it’s cut rifled. But,, those aren’t varmint cartridges. I would add also that 10sht grouping is not an indicator of field ‘accuracy’. So that implication is merely hype at this point. I’ve got one on order in .338 Lapua. I severely doubt I’m capable of matching or exceeding the guaranteed grouping, but look forward to getting “up to snuff” and eventually, hopefully, beating Les. He, apparently, is the one who test fires them before they go out the door and the targets proving the gun’s accuracy are all from him. So far, no reviewers have been able to even match his groupings, that I’ve found. With regards to “field accuracy,” of course that isn’t field accuracy. That’s controlled environment bench rest accuracy. Even if you duplicate the exact conditions, it still doesn’t guarantee YOU’LL group that low. Everyone shoots differently, environmental factors influence accuracy, etc… He backs up his guarantee with targets that prove that individual gun can do sub 1/2″ MOA and that’s as far as that guarantee goes. The rest is up to the individual shooter and shooting conditions, as should be expected. No manufacturer guarantees that you’ll shoot what the gun’s capable of, just that the gun is fully capable of hitting the declared mark. In response to Joel: These are bolt action, generally long range, precision rifles. If you want something in .223 grab one of his ARs that I’ve heard are incredibly accurate for what they are. Personally, I don’t see the 5.56 as a bolt action round at all and assume Les feels the same. Now, to the gun itself, I do feel the gun may be a bit pricey given the components and such, but if it performs as declared, it’s well worth that and more, in my opinion. You’d be hard pressed to build your own or get any other for that price that will do sub 1/2″ MOA, unless you have the hookup. HYPE?! What a foolish thing to say. It is important to know what the rifle can do under controlled circumstances. Repeating a 0.5 inch group for 10 shots is nothing short of legendary. Whether YOU can duplicate it isn’t the issue. Knowing what the gun is capable of IS! What? Do you want them to say…”well it can do 2″ groups for some people and 5 inch groups for others blah blah?” THINK!!! I’m amazed, and if I could afford one right now, I’d buy the 338 Lapua and go have some serious fun! Hype?! Hilarious! Hi I want buy a rifle in .308 win, but I dude in a CZ 750 S1 MI or a Les Baer tactical, I have see the data group of CZ and is very good, but I think that the LES BAER is better, can you say me what is more accuratte? THANKS. I purchased one in .308 about 3 years ago. It deivered as advertised using Federal Gold SMK ammo in both .168 and .175 BTHP as well as Black Hills. My only regret is that they are no longer made or available or I’d buy one in .223 as well. It shoots as well or better than my Tubb 2000 or Accuracy International and they cost twice as much using similar Nightforce scopes on all three. If you can find one grab it up…you won’t be disappointed !